Resource Manager Dave Lawlor shares the history of Northern Snakeheads in Dogue Creek and recounts a close call with this invasive fish at Huntley Meadows. 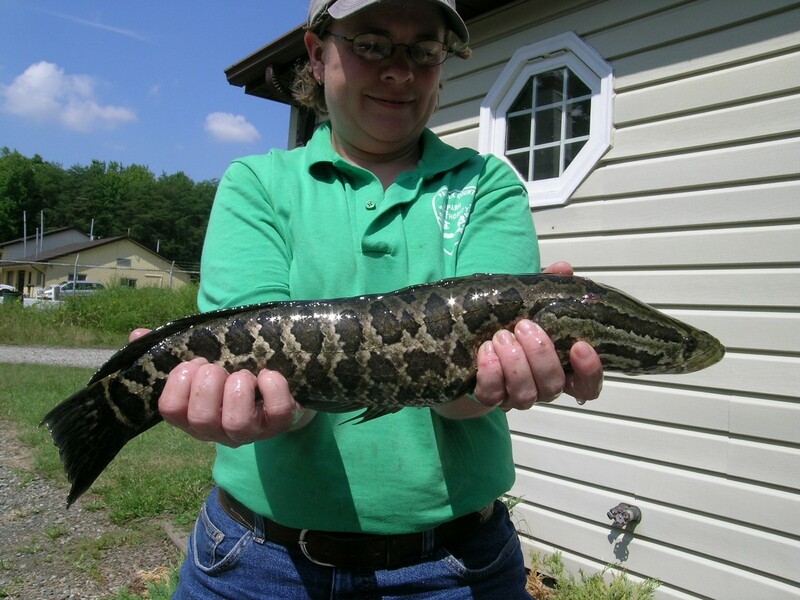 Former Huntley Meadows Park staff member Danielle McCallum holds a 17” Northern Snakehead caught while electro-fishing Dogue Creek in 2008. This was the first snakehead caught in the park. Huntley Meadows Park, a 1,500-acre complex of freshwater marshlands located in Alexandria, Va., has long been a destination for birders, wildlife photographers, and students. No matter the season, people flock to the boardwalk trail to observe migrating birds, soaring raptors, moss-covered turtles, beavers, delicate dragonflies, and many more species in the park’s 50-acre central wetland, the largest in the region. Freshwater wetlands are considered rare habitat in the Washington, D.C. region and harbor the greatest biodiversity of any habitat type in temperate climates. However, in recent years Huntley’s central wetland has come under threat from an invasive fish species, the Northern Snakehead. If allowed to breed within the park, with their voracious appetites snakeheads have the potential to wreak havoc on the park’s large populations of amphibians, reptiles, birds, and mammals. Listed by the state Board of Game and Inland Fisheries as a predatory and undesirable exotic species, snakeheads have been slowly migrating from the Potomac River up Dogue Creek toward the central wetland since 2004. Nine snakeheads were caught in the tidal section of the creek that year, and a year later two fishermen caught more than 80 young fish only a mile and half downstream from the park. Once snakeheads were found in the non- tidal sections of Dogue Creek, park staff became very concerned and took action to try to protect the central wetland from invasion. 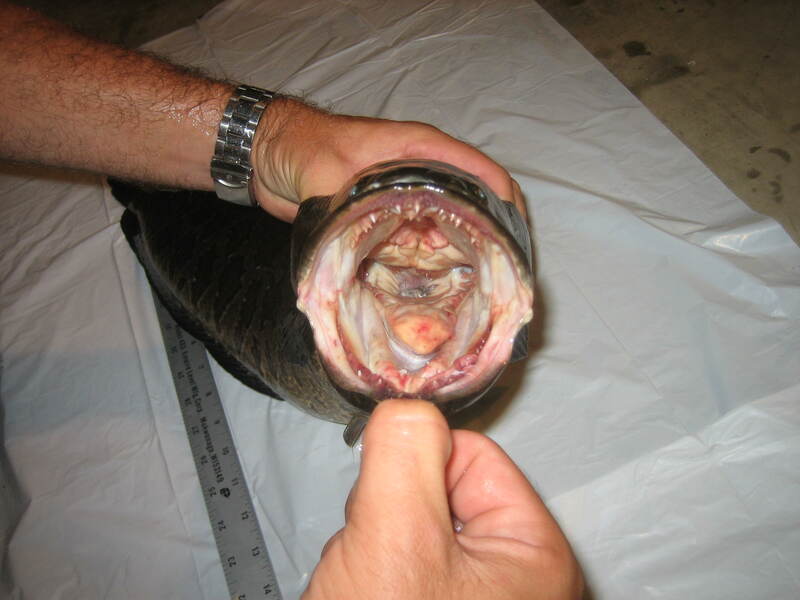 Northern Snakeheads have razor sharp teeth. 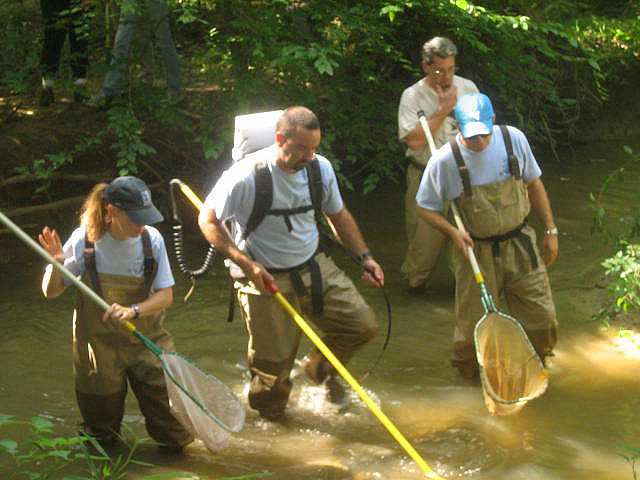 In 2006, the Resource Management staff at Huntley Meadows requested staff from the Watershed Planning and Assessment Branch of the Department (WP&AB) of Public Works and Environmental Services (DPWES) conduct an electro-fishing survey of Dogue Creek at the park’s southern tip. Electro-fishing doesn’t kill the fish but renders them immobile for several seconds, enabling staff to net, identify, and count the fish before releasing them. With this survey, staff attempted to determine if snakeheads had made the mile and half migration up the creek from the Route 1 overpass where 80 snakeheads had been caught the year before. Unfortunately, one 17” snakehead was caught inside the park just as the shocking crew was finishing for the day. Although just one fish was caught, it was evident that snakeheads had made the long upstream migration and were only about one mile below Huntley’s central wetland. and Dave Lawlor shock, net, and count fish in Dogue Creek at Huntley Meadows Park in 2010. No snakeheads were found during this survey. In 2007, staff conducted another electro-shocking survey in Dogue Creek at Wickford Park, which is about one mile upstream from where the 17” snakehead had been caught in 2006. This section of the migration would be much tougher to navigate due to shallow wetlands that periodically dry up as well as multiple beaver dams that impede migration. Although no snakeheads were found during the survey, park staff and visitors began to see snakeheads in the central wetland in 2009 and 2010. Two of these fish were very young, indicating snakeheads were either reproducing in the park or immigrating into the wetland from Dogue Creek. During the spring of 2011, Huntley Meadows Park patrons and volunteers reported seeing a large snakehead in the central wetland along the boardwalk just past the loop. Soon reports were coming in almost daily and the snakehead number doubled when two large snakeheads were seen in a ditched portion of the wetland, right on top of the water. Immediately park staff jumped into action and tried to net the fish, but these large fish were elusive. Park staff became very concerned that the fish would breed in the wetland, potentially releasing hundreds or thousands of baby snakeheads which could take over the central wetland and wreak havoc on the wetland’s incredibly diverse aquatic populations. 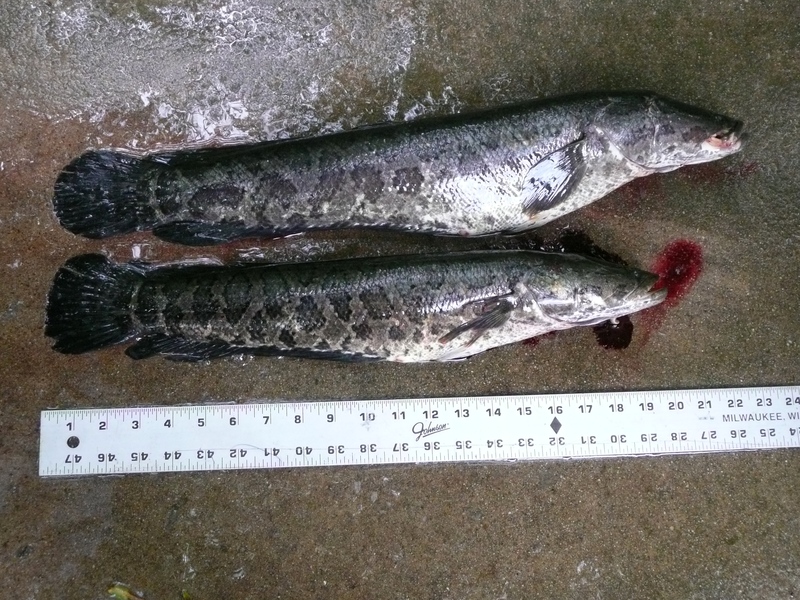 Two large snakeheads were netted in the central wetland at Huntley Meadows Park in 2011. Shannon Curtis and Chad Grupe from the WP&AB were contacted. 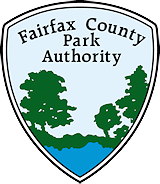 These folks live and breathe water quality and are sought after professionals when it comes to fish and anything that lives in Fairfax County waters. They brought their electro-fishing backpacks to the park to try to help catch the two large snakeheads before they started upsetting the wetlands sensitive ecologic balance. Within an hour they caught two large snakeheads measuring 20” and 25”. After another hour or two of searching no more snakeheads were located in the wetland and the search was called off. Both of the large snakeheads were females and they were packed full of hundreds of eggs. As required by state law, the fish were destroyed. Staff examined the stomach contents and the large fish’s stomach contained a large goldfish (Carassius auratus) and the smaller fish’s stomach contained a smaller fish or tadpole of an undetermined species due to nearly complete digestion. Huntley staff continues to be diligent in the search for more snakeheads and we expect this will be a long-term battle. 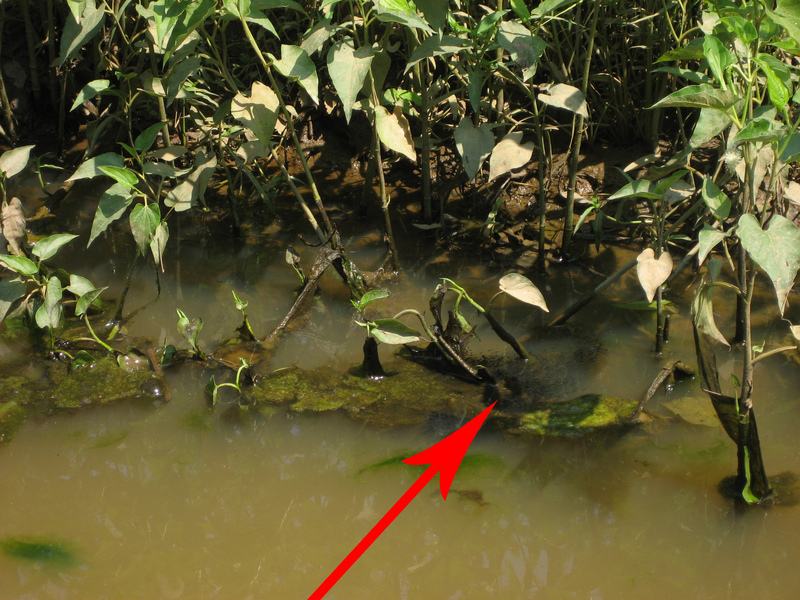 The severity of the Northern Snakehead problem was made clear this summer when, during a survey at Old Colchester Park and Preserve, Park Authority staff spotted this dark cloud in a tidal marsh near the Occoquan River. It was identified as a “fry ball,” or a group of 10,000-15,000 newly hatched snakeheads. This entry was posted in Uncategorized and tagged Alexandria, Dogue Creek, DPWES, electro-fishing, fish, Huntley Meadows Park, invasive fish, Northern Snakehead, Occoquan River, Old Colchester Park and Preserve, snakeheads, VDGIF, WP&AB on August 8, 2012 by Fairfax County Park Authority.